Prescott is a U.S.-certificated, Part 135 On-Demand Air Carrier—a global provider of tailored transportation services for passengers and freight, including time-critical, high-value, and out-sized cargo. Our mission is to provide each client with right-sized and responsive air transportation solutions while delivering the highest levels of safety, security, and reliability. We can and will tailor our support to meet your needs precisely. We work closely with U.S. and internationally based Fortune 500 firms, U.S. federal government and state agencies, freight forwarders, and international relief and humanitarian assistance organizations. We carry your most important resources—your critical equipment, people, and what they need to do their jobs—to your defined locations, whether they are easy to get to or difficult. Our unique fleet can land on short, unimproved airstrips—including dirt—and get you to places where others won’t even try. Our planes are capable, flexible, and reliable. We have a safety-driven culture. In more than 11 years as a commercial service provider, we have never had an accident. We constantly reengineer our processes, tools, and technology to achieve a safety baseline that is unquestionably higher than the regulations require. We get you there - On Time - Anytime, Every Time. One team dedicated to getting you there safety. If it can be delivered, we've been there before. We operate the extremely reliable and cost-effective EADS CASA CN-235s. Powered by two General Electric CT7-9C turboprop engines, our aircraft can transport passengers and cargo payloads of up to 7,500 pounds. Our fleet can land on very short, unimproved airstrips and require little or no ground support. The CN-235s are equipped with a cargo ramp and door, which gives them full roll-on/roll-off rear ramp capability. The CN235 is the ideal solution when right-sizing is important and your on-load or delivery destinations are short, undeveloped, and remote. We have access to tens of thousands of airports and unimproved runways globally—a benefit for our customers when selecting pick-up and off-load sites. 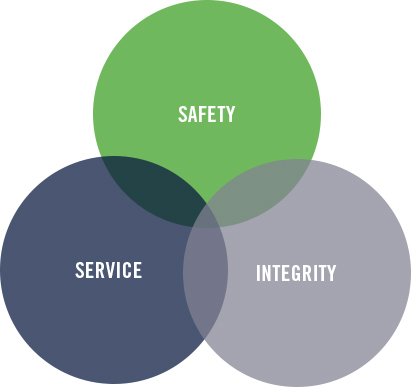 These three, non-negotiable core values speak to who we are and guide everything we do. They focus our commitment to your satisfaction with the services we provide and support we deliver. This is our most basic commitment to our customers and ourselves. Safety – Safety is our first priority. We continually, proactively identify and manage risk. Our commitment to safety permeates our culture from top to bottom and defines not only when we will go, but how we will get your job done. An 11-year accident-free record does not happen by accident: we work hard at it every day. Service – Your challenges are ours. As our customer, your satisfaction determines our success. We have a history of reliable service and creative partnering with our customers to meet their needs precisely. Integrity – Integrity and personal accountability are indispensable to our mission. Our actions are consistent with our words: we will act with honesty and exceed the highest moral and ethical standards. By adhering to these values throughout our history, we have earned the trust of our customers, and we aim to keep it. Our customers expect more of us today than yesterday, and we expect more of ourselves. In our industry, we must continually find new ways to better ourselves and the communities we serve. Prescott remains actively committed to improving the communities where we live, work, and do business. We understand our fundamental responsibility to promote the protection of our environment, and we have partnered with charitable and non-governmental humanitarian assistance organizations to make meaningful enhancements to the quality of life throughout the underdeveloped world. Prescott Support Company is a U.S. certificated, Part 135 On-Demand Air Carrier and global provider of tailored transportation services. We operate EADS CN-235 aircraft and specialize in the movement of time-critical, high-value and outsized cargo while delivering the highest levels of safety / security, reliability and customer satisfaction every day. Plans, directs and supervises accounting activities within the department. Applies principles of accounting to process financial and regulatory information and prepares financial reports by performing the following duties personally or through subordinates. Perform general cost accounting; maintain accounting records, and other related duties in the daily administration of accounting department through computerized and manual methods. Supervise accounts payable duties including trade and interline payables ensuring that expenditures are charged to appropriate accounts and accounting periods. Supervise revenue accounting and statistical recordkeeping duties to insure proper recordkeeping of flight activity and statistics for revenue and associated costs, including non-flight and miscellaneous revenues. Supervise accounts receivable functions including customer credit matters and customer service. Reconcile general ledger accounts to their related subsidiary ledgers and adjust the general ledger accordingly. Assist external auditors with preparing schedules, providing explanations of supporting materials and procedures, and preparing any other necessary data. Maintain records of all financial documents with appropriate supporting material; update records as necessary. Recommend, design, and implement any necessary department controls and procedures. Responsible for preparing monthly and quarterly financial statements, such as balance sheet and income statement and various ad hoc reports. File all appropriate tax forms and reports with government agencies. Provide assistance internally and to parent company with inquiries regarding all aspects of accounting functions. Work with employees and departmental managers/supervisors to gain knowledge and understand changes in operations to support proper recognition of accounting data. Ability to work with mathematical concepts such as probability and statistical inference, discounts, interest, commissions, proportions, percentages, area and volume. Ability to apply concepts of algebra and geometry such as fractions, percentages, ratios, and proportions to practical situations. Ability to solve practical problems and collect data, establish facts, and draw valid conclusions where only limited standardization exists. Ability to interpret a variety of instructions furnished in written, oral, diagram or schedule form and deal with several abstract and concrete variables. Expertise required with MS Excel and 10-key calculator; high proficiency with MS Word, Adobe Acrobat and MS Outlook; must be able to type 55 w.p.m. and be familiar with utilizing a variety of office machines. Must be available to work days, evenings, weekends, nights or holidays, if required. Must be able to travel occasionally. While performing the duties of this job, the employee is regularly required to use hands to finger, handle, or feel and reach with hands and arms. The employee is frequently required to sit. The employee is occasionally required to stand; walk and talk or hear. The employee must occasionally lift and/or move file boxes of records weighing up to 25 pounds. Must be able to see computer screen, printed ledgers, and written data. Specific vision abilities required by this job include close vision, color vision and ability to adjust focus. While performing the duties of this job, the employee is occasionally exposed to moving mechanical parts and fumes or airborne particles from parked vehicles offloading freight. The noise level in the work environment is usually moderate. Post-conditional offer of employment drug test is required. Random drug testing is required of all Prescott Support Company employees. PRESCOTT SUPPORT COMPANY IS AN EQUAL OPPORTUNITY EMPLOYER. Prescott Support Company is a U.S. certificated, Part 121 Supplemental Carrier and global provider of tailored transportation services. We operate the Lockheed L100-30 (L382G) Hercules and EADS CN-235 aircraft specializing in the movement of time-critical, high-value and outsized cargo while delivering the highest levels of safety / security, reliability and customer satisfaction every day. Responsible for exercising operational control in accordance with FAR 121/135 requirements for Prescott Support Company’s domestic and international operations. A key member of our flight operations team, member will be responsible for company compliance with all FAA regulations and policies as they are applicable to the flight dispatch of company aircraft. Responsible for pre-flight planning, issuance of flight releases, flight progress monitoring, and providing Prescott aircrew with the latest available flight information to ensure safe and economical flight operations. Applicants must be capable of and comfortable performing in a team-oriented, safety focused, and highly demanding environment requiring strong organizational, technical, and communications skills. Provides dispatching services encompassing all aircraft and aircrew related support during charter operations. Coordinates with the Captain/Pilot-in-Command to determine the suitability of weather, airfield, and traffic conditions and is jointly responsible for the safe operation of each flight. Secures civil landing and commercial over-flight clearances for all domestic and international flight operations. Arranges diplomatic over-flight and landing clearances for charter flights as required. Responsible for arranging aircraft ground handling and fuel on-load / services and coordinates cargo on-load/off-load at departure, enroute, and recovery locations. Coordinates customs and immigration at enroute destinations. Files required General Declaration paperwork. Carefully reviews NOTAMs, weather, and all conditions effecting route of flight under the dispatcher’s control. Prepares the Aircraft Flight Release considering weather, required fuel loads, cargo/passenger payloads, aircraft airworthiness, and routing strategy for all aircraft under the Company’s operational control. Constantly monitors system wide weather and inputs data into Company flight Planning and CMS computer systems to maintain current flight status information. Retrieves hourly weather, winds aloft, and NOTAMS for all stations and alternates noting changes that may affect operation. Routes and re-routes aircraft and flight crews to maintain schedule integrity, and to accommodate maintenance requirements or crew legality. Participates in shift turnover and conveys critical information and/or changes that may impact flight operations including: current and forecast weather conditions, Air Traffic Control (ATC) delays, maintenance deferrals, or deteriorating airport conditions, inoperative NAVAIDS, ground support equipment, crew duty limitations, and potential contingency diversionary plans. Creates and maintains database entries (to include flight schedules, trip cost forecasts/projections, and training records in the Flight Operations System (FOS) for use by management and financial personnel. Launches and recovers multiple aircraft types from the Myrtle Beach facility to include marshaling of inbound/outbound aircraft. Will be qualified/trained to operate ground equipment assigned to the main operating base. Required to perform other duties as assigned. Individual must be able to perform each essential duty satisfactorily. Must possess an active FAA Aircraft Dispatcher Certificate and be certified as a Flight Control Aircraft Dispatcher with full authority to exercise operational control over company flights. Experience with Rockwell-Collins’ FOS software highly desired. A high degree of work accuracy required. Work Environment is fast paced and dynamic requiring the ability to multi-task and prioritize workload. You should be a self-directed team player, show initiative, and be able to make decisions on your own. Candidates must have good organizational skills, excellent attention to detail, and handle stress well. High school diploma (college degree preferred). Minimum of three (3) years Domestic/International experience. Must be available to work days, evenings, weekends, nights or holidays and to be away from home for extended periods of time. Must be available to travel domestically and internationally without restrictions. This is a Safety-Sensitive position. Post-conditional offer of employment drug test is required. Routine, random drug testing is required of all Prescott Support Company employees. WHAT IS PRESCOTT’S SAFETY RECORD? WHAT SECURITY SCREENING PROCEDURES ARE IN PLACE? WHAT AIRCRAFT DO YOU USE FOR AIR CARGO CHARTERS? WHAT IS THE MAX PAYLOAD OF YOUR CASA CN235? HOW DO I FIGURE OUT THE DIM WEIGHT? WHAT TYPE OF TRAINING IS PROVIDED TO PRESCOTT FLIGHTCREWS?